Featured Site:Indian Occupation of Alcatraz (1969-71) Professor Troy Johnson of UC Berkeley has compiled these rare and fascinating photos (contributed by Ilka Hartmann, Michelle Vignes, and the National Park Service). His introduction helps to place them in their historical context. A rare look into a key moment of indigenous activism. American Indians of the Pacific Northwest Award-winning, visually rich site from the University of Washington and the American Memory Project. Inigenous People's Literture Extensive site that in addition to links to hundreds of writings from around the world includes a comprehensive set of links to North American tribal sites and tribal cultural resources. Native Web: History Pages Great resource from one of most comprehensive indigenous resource sites on the web. Northwest Coast Native History First person accounts by indigenous Natives of the Us and Canadian Pacific coast. Cherokee Nation v. Georgia (1831) Landmark Supreme Court case on status of Indians under U.S. constitution. Documents of the Sand Creek Massacre (1864) European American version of events. Costanoan-Ohlone California Indian homepage A resource for those interested in contemporary issues, including federal recognition and Native American sovereignty, particularly with regard to tribes in California. Linked to over fifty other pages. Updated regularly. California Indian Library collection The collection itself was funded through UC Berkeley with the intention of making duplicate materials widely available at libraries in central and northern California, while returning originals to the various tribes. Page has very useful bibliographies on Native American tribes in that region. Inupiat of Artic Alaska Treats early history of Inupiat people, effects of cultural contact, significant legislation, and present-day concerns. Very readable. Includes some wonderful photographs. Nez Perce (Oregon, Washington, and Idaho) Created by three U of Idaho students, the page contains a historical overview, with supplementary links, as well as a discussion of current events. A History of Northwest Coast Indians by Bruce Hallman. Organized chronologically around European expeditions and points of contact between Europeans and Northwest Coast Indians, but integrates a variety of materials, including oral histories. Lakota Wowapi Oti Kin Unofficial Lakota Information Home Page maintained by Martin Broken Leg and Raymond Bucko. Intended as a site for ongoing dialogues regarding contemporary issues as well as being a historical, cultural, and literary resource. Extensive Lakota Dakota bibliography. Works by Charles Eastman, Zitkala-Sa (Gertrude Simmons), and Karen Strom, among others, on line. Native American Documents Project, California State University, San Marcos Major project beginning with Rogue River War and Siletz Reservation collection. Important resource for those interested in U.S. federal policy on Native Americans, particularly with regard to land allotment. Native American Stories On-line An eclectic sampling of stories from the Hopi, Piaute, Navaho, and Nez Perce traditions, among others, as well as a few contemporary tales. Native American Poetry On-line An index of contemporary Native American poets that includes not only reproductions of a number of poems but also information on several poets, such as N. Scott Momaday, Paula Gunn Allen, and Joy Harjo (and her band, Poetic Justice). Impressions of an Indian Childhood, by Zitkala-Sa Electronic version of the piece that first appeared in Atlantic Monthly in 1900. It centers around the author's relationship with her mother, but deals also with changes wrought by the arrival of missionaries. Indian Boyhood, by Charles Eastman Text is reproduced in its entirety. List of (and links to) chapters provided. Chetro Ketll Great Kiva Created by UC Santa Barbara anthropology, this site allows visitors to virtually explore the sights and sounds of the Great Kiva (located in northern New Mexico's Chaco Canyon)--guided tours, movies, and archaeological descriptions, as well as an audio recording of Pueblo singers. Indian Pueblos Information listed pueblo by pueblo.A good site to check out before taking an actual trip to the pueblos because it also provides a map, a conduct guide for visitors, and two event calendars. Updated regularly. Unofficial N. Scott Momaday homepage An ambitious project, still under construction, created by Adora Pozolinsku. It includes not only the works of Momaday but also biographical information, interviews, critical essays, and movies and videos that treat his work. Intended for students and scholars as well as for fans of the writer. National Museum of the American Indian A promising work in progress. Currently most useful as a resource for finding other sites on Native American art. Also has basic information on the museum itself. Electric Gallery's Southwest Indian Art Features work of Lawrence W. Lee, Mary E. Wyant, and Becky Olvera Schultz, with brief biographical sketches of the artists. 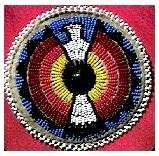 American Indian Computer Art Project Created by Turtle Heart, an Ojibway artist. Unique fusion of tradition and technology. First Nations Information project on Canadian tribal peoples Although unfinished, this site is a good general resource on First Nations: thorough, sophisticated, and painstakingly organized. It has been established to provide information on Economic Development, Community Planning, Self-Government, Education, and so forth, to the First Nations of Canada, but will benefit anyone interested in indigenous peoples. Native Web A comprehensive resource for information on native peoples (primarily, at this point, in the Americas), arts, cultures, lands, languages, organizations, legal issues, histories, politics, etc. Intended as a cyber-place for the Earth's indigenous peoples, it also includes event calendars, news, and information regarding listservs. Western US Indigenous Nations Sites While these sites vary greatly in quality and in their capacity to equitably represent idigenous nations, many offer rich insights into Native perspectives on the history, present and future of the region.